Best Flea Markets in London 4.8125 out of 5 based on 16 ratings. 16 user reviews. London is a wonderfully diverse and eclectic capital city, which is also famous for its flea markets and vintage shops. 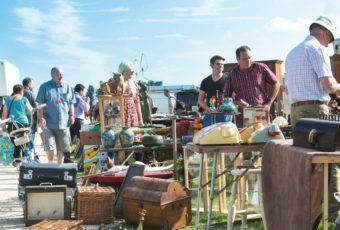 With so many boroughs and neighborhoods that all offer unique experiences, there really is plenty to write about flea markets in London! Head northwards towards Camden for rock ‘n’ roll vinyl records, memorabilia and unusual knick-knacks. Stray eastwards to Brick Lane and Hackney for trendy finds and quirky second-hand clothes. If you venture down south to the peaceful borough of Greenwich you will find delicate crockery and fine antiques. 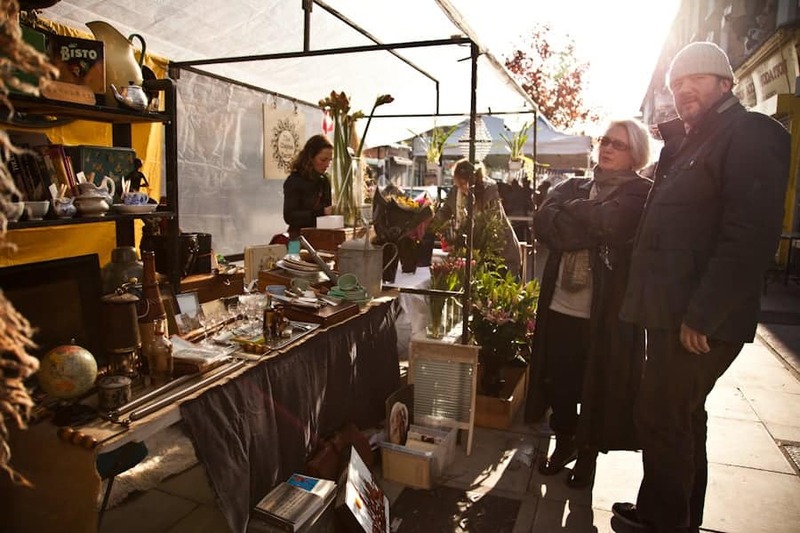 Enjoy our list of the 7 best flea markets in London! Tucked away amidst the hectic area of north London, lies a quiet pedestrian street; Camden Passage (not to be mistaken with Camden Market). Home to a collection of 200 vintage merchants and mini markets, this chic passage provides customers with specialized products, rare antiques and quirky trinkets. 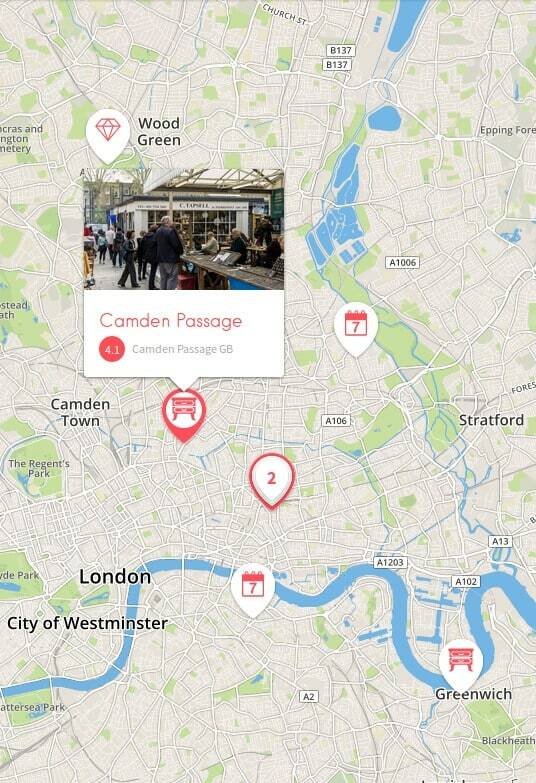 Camden Passage is made up of four separate markets that all offer something a little bit different. 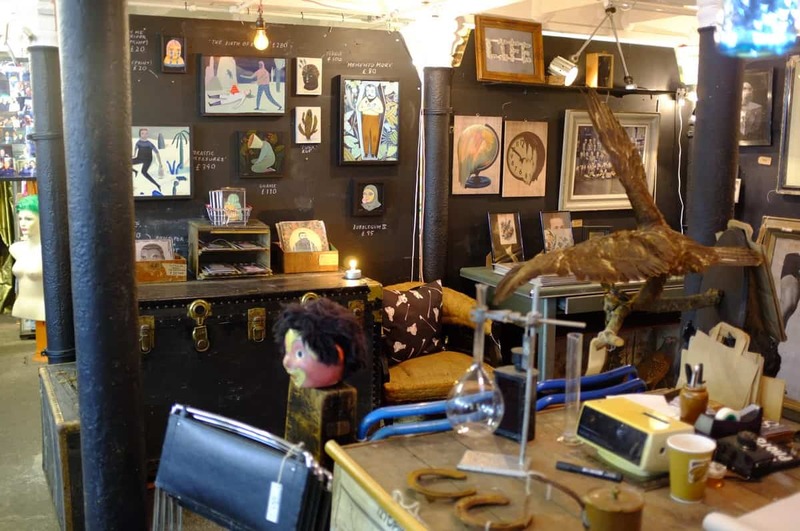 For collectibles such as stamps and coins, head to Annie’s Antique and Vintage Market and for one-off kitsch items try out Camden Passage Market. Charlton Place Market offers rarities and collectibles and opens its doors every Wednesday and Saturday. Pierrepont Arcade Market is a covered market towards the far end of Camden Passage and is open throughout the week. No matter what day you visit Camden Passage, there will certainly be somewhere open to cater for all of your vintage needs. Brick Lane is famous for a lot of things, such as its impressive and controversial street art, wide selection of Curry houses, overpriced coffee shops, edgy east end hipsters and most importantly, the Brick Lane market. While its name might suggest it, this popular flea market isn’t just a street filled with flea market booths and rowdy merchants. It is actually a labyrinth of five flea markets that are all intricately entwined. The Truman Markets are based within the borders of the 11-acre Old Truman Brewery, at the northern end of Brick Lane, and consist of The Sunday UpMarket, the Vintage Market, the Backyard Market, the Tea Rooms and the Boiler House Food Hall. The extensive array of vintage wares and bric-a-brac on offer is almost overwhelming. After a day of shopping for second-hand clothes, vintage crockery, silverware and homeware, you can find some delicious authentic global cuisine in the Boiler House Food Hall. Stop there for a well-deserved bite to eat and a refreshing pint of beer. No wonder why Brick Lane flea market is an all time favourite of flea market enthusiasts in London! When: Open from early Sunday morning to around 3:00 p.m. This quintessentially British market is one of the most frequented and well-known London shopping destinations. 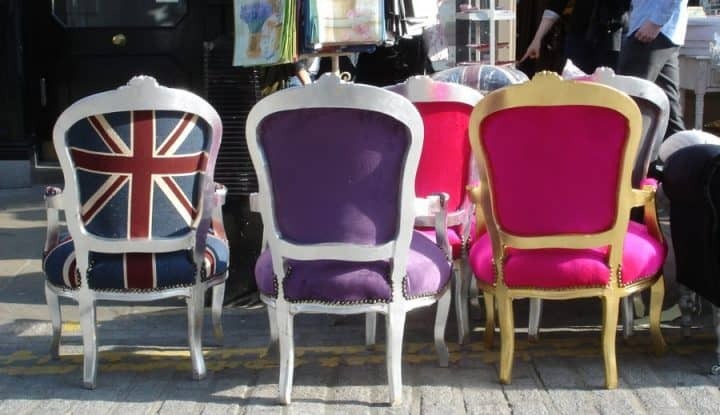 No visit to Notting Hill is complete without taking a trip to the famous Portobello Road Market. While Saturday may be the busiest day on Portobello Road, it is also the best day to visit. 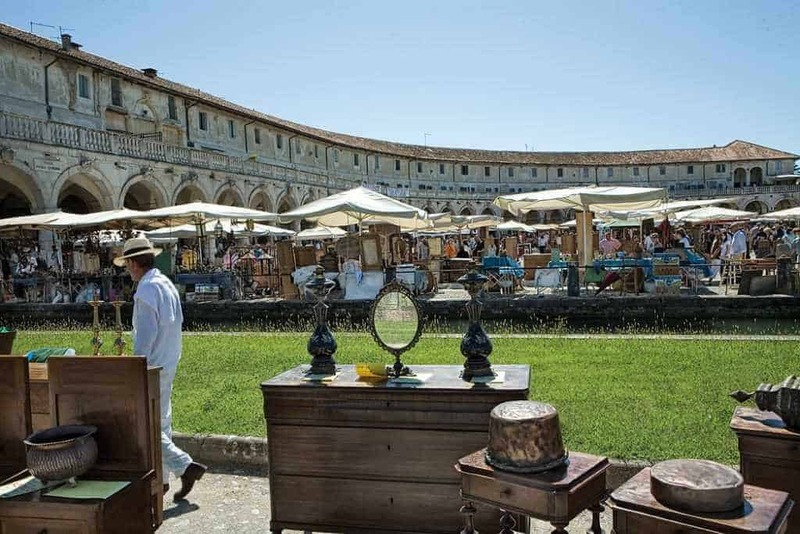 Antique enthusiasts open their market stalls and sell countless artifacts, memorabilia and treasures. 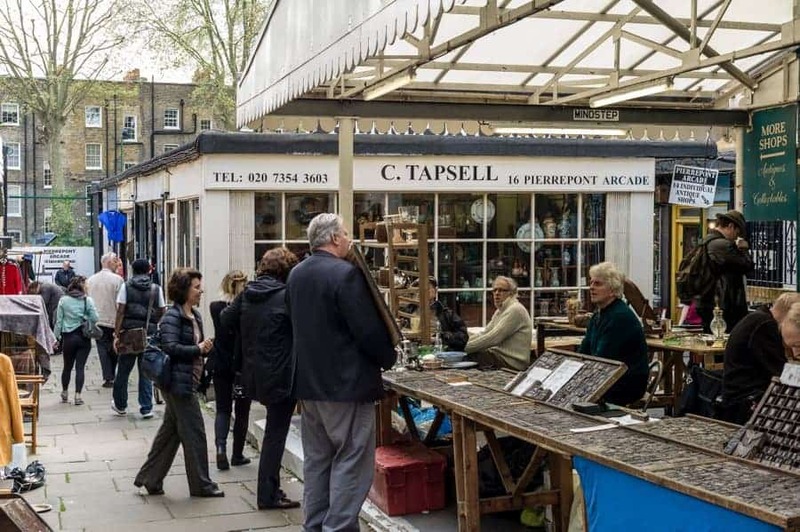 Each vendor is an expert in their field which means that no matter what it is you’re searching for, be it antiques or just some great advice; you are guaranteed to find it on Portobello Road. 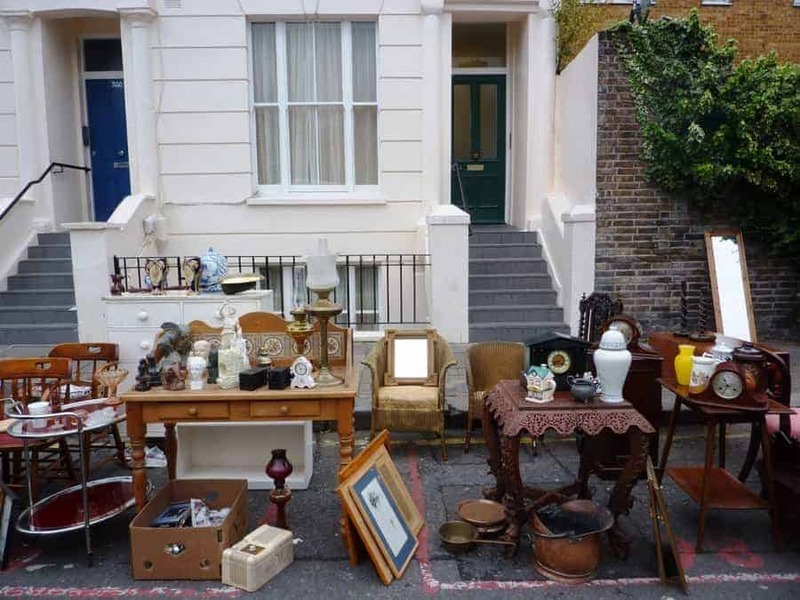 After sieving through the assortment of antiques and vintage knick-knacks, head further down the road towards Ladbroke Grove tube station for a wide variety of quirky second-hand fashion and tempting street food. Back when it first opened in the 17th century, Old Spitalfields started off as just a humble farmers market. Today it is has transformed into one of the most exciting and dynamic shopping locations in London. Open seven days a week, this shopping haven is home to antique and vintage merchants, award-winning restaurants, tailors and even hairstylists. Old Spitalfields Market hosts one-off monthly events such as craft beer festivals, vinyl record fairs and swing festivals. Many people refer to this place as a village, and quite rightly so; the vast amounts of services and products on offer are unfathomable. Customers come back time and time again for specialist market days, carefully planned events and the magnetic atmosphere that radiates within the walls of Old Spitalfields Market. Like most British flea markets, Chatsworth Road Market unapologetically takes over a part of this Hackney high street every Sunday morning. This fashionable flea market has been in existence since the 1930s, back then it opened for business up to five days a week with over 200 stalls. 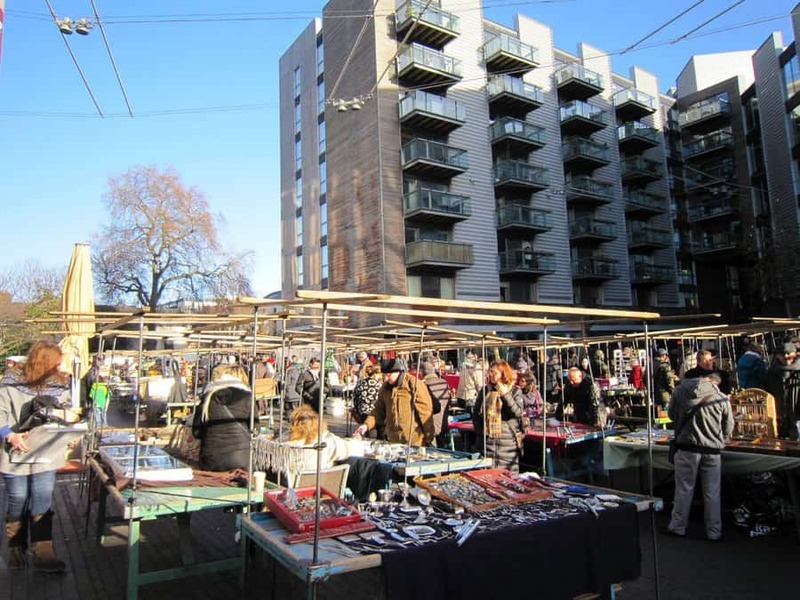 Nowadays it rather modestly opens every Sunday with 50 active traders selling their high-quality goods to the public, but nonetheless remains one of London’s best flea markets. Chat with locals whilst you browse all of the stalls selling paintings of beautiful landscapes, polka dot print shirts and old-fashioned metal tins that once stored Bisto gravy granules and PG tips tea bags. Most of the shops and flea market stalls that inhabit Chatsworth Road are independently run rather than typical high street chains, which is quite unheard of considering it is one of London’s longest high streets. 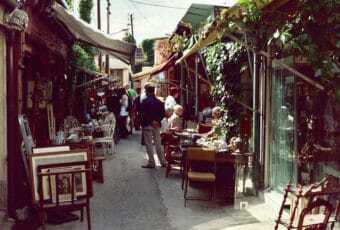 This, combined with the Sunday flea market, makes it the ideal spot to scout out unusual and eccentric products. This south London market was established 280 years ago and is the only historic market that is set within a World Heritage Site. Another rare feature of the Greenwich market is that it is open seven days a week, with different days dedicated to certain themes. Greenwich Market is prepared for the typical drizzly British weather; the vintage gold mine is within a covered arcade which means that no matter the weather, visitors can still enjoy browsing antiques without having to juggle an umbrella in one hand and their purchases in another. 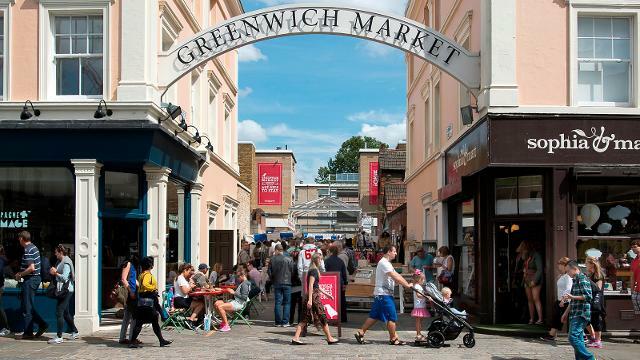 If you want a marketplace that is not only full of great quality vintage wares but also tantalizing food stalls, handmade crafts and surrounding art galleries, then Greenwich Market is the place for you. As well as being a retro hotspot, it is the perfect destination to simply spend all day unwinding with friends, eating good food and last but definitely not least: do some shopping! Situated in Bermondsey Square, not far from the River Thames, this bustling market is home to all manners of wacky furnishings and bric-a-brac goods. 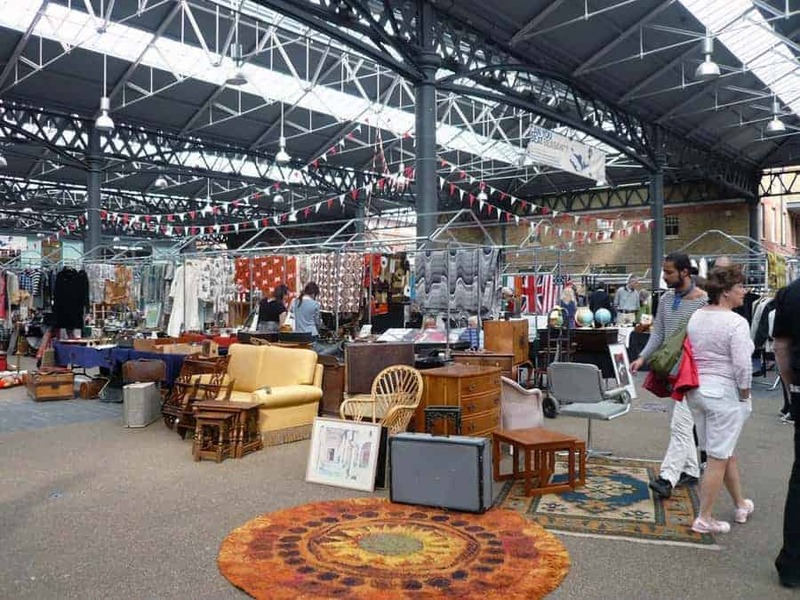 One part car boot sale, other part flea market – Bermondsey Market is the kind of place where you really need to roll up your sleeves and get stuck in. After digging through all the junk, you will surely find yourself a gem. For the best chance of picking up something worthwhile, you will need to set your alarm clock for a rather painful time. Most of the good stuff is long gone by mid-Morning, so the ideal time to arrive is just before the sun rises. Remember that “if you don’t need a flashlight, you’re already too late“. And what a charming setting – surrounded by glorious second-hand treasures as the sun provides its dazzling morning display. Bonus: Markets in London on a map! 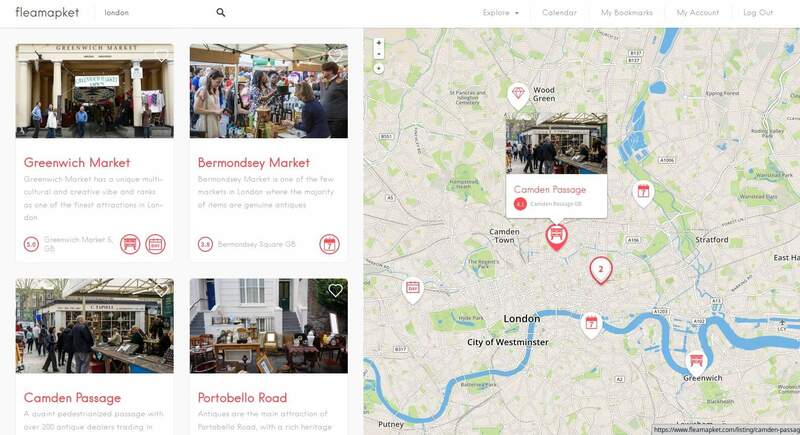 You can now discover London’s best flea markets and antique fairs on a map! Not only have we included all the above flea markets, but we’ve added to the mix some of the UK’s most acclaimed antique fairs located within one hour from London, like Sunbury Antiques Market, Ardingly International Antiques & Collectors Fair, Alexandra Palace Antiques & Collectors Fair or the Great Wetherby Racecourse Antiques Fair. Just click on the image below to access our map feature for free. Everyone loves a bargain. 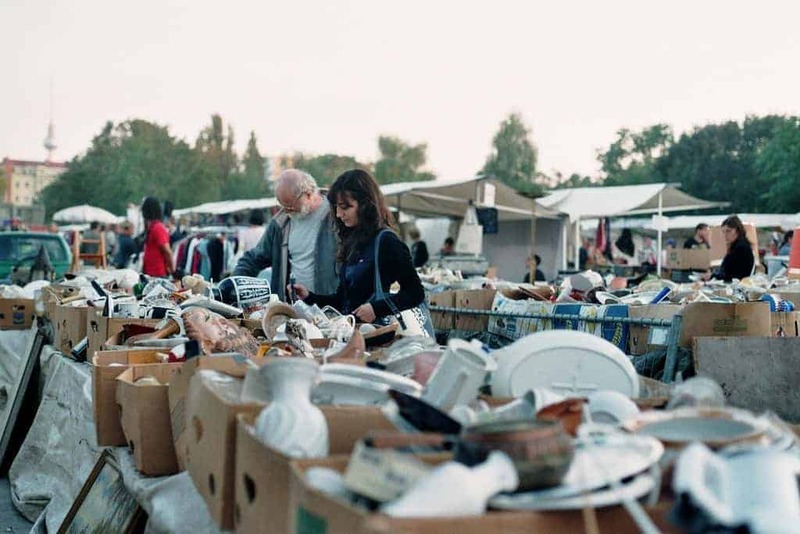 And flea markets and Antiques Fairs have become rather hip in the UK over the last few years, mostly as a way to decor and furnish on a budget. hi.I want a space in flea market for my some handicraft stuff from India.